The name Walter Afanasieff is not a household name, which I’ve recently learned is a shame. I had never heard his name until yesterday, but after typing it into the Internet, learning that he was important enough to merit a Wikipedia page (no photo, though, so … ), and reading that he worked with an impressive list of artists, it became clear that I needed to know more. He spent the 1980s recording with the likes of Aretha Franklin, Lionel Richie, Whitney Houston, and Patti LaBelle. 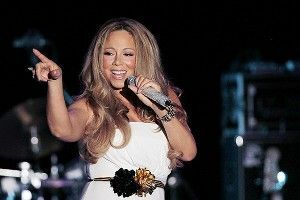 But as his discography reached the ’90s, there’s one name that routinely appears over and over again: Mariah Carey. The work that these two did together in a 10-year span is remarkable. Below, a short list of their collaborations. While all of these are important, three of her biggest, most iconic songs are the ones that they wrote and/or produced together (“Hero,” “One Sweet Day,” “All I Want for Christmas Is You”). So there’s no denying Afanasieff’s influence on her career and music in general (he also produced The Bodyguard soundtrack and a little song called “My Heart Will Go On”). @jacobmemoirs I think you can spill the news ;) I’m too excited my father is finally going to be working with her again after 16 years! Who is this? Answer: Isabella Afanasieff, daughter of Walter. The “her” in question? Mariah Carey. Just scrolling through Isabella’s Twitter account will probably make you wish you were incapable of the clicking motion, seeing that it screams, “Look at me, my dad is kind of famous, screw you for not believing that he’s my dad, let your haters be your motivators #TeamBreezy.” But it does seem like she’s telling the truth. At the Internet’s Grantland, we’re not the biggest fans of unconfirmed rumors, but this is one we’ll take the bait on, simply because it’s just too important should it turn out to be true. Is yet another Mariah reinvention under way, this time with the man who helped make her a timeless legend? Yes, please. I swear, Isabella, if you’re making this up, be prepared to have 30 torch-wielding staff members at your door clutching copies of Emotions.